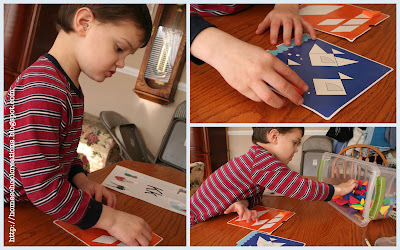 This week I'll be sharing about our preschool fun studying the letter "K" and at the end of the post you will find Mr. Linky so that you can participate too in the fun by sharing what you've been doing during your preschool time. 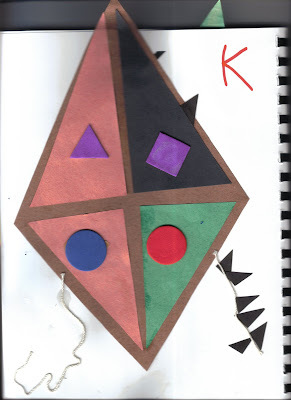 The alphabet book page for the letter "K" was a Kite (and I won't be using my scanner anymore to put these in - pictures are much better I think!). The shape of the kite gave us the opportunity to talk about various shapes and have fun piecing shapes together to make different things (see the pictures in Math below). Tracing is always a challenge, but even more so when you're trying to trace keys! But we did and tried to make it a little more interesting by creating a key pattern: one big key, two small keys, etc..
We have a bazillion toothpicks in our house and so we put a few of them to good use this week. It was only after we made our little toothpick craft that I realized that perhaps "K" wasn't the letter we should have chosen. First, Zachary sorted the toothpicks by size (short and long) and then had much fun getting sticky with glue. He dipped the toothpicks in glue and then placed them on cardstock to form the letter that we've been studying. 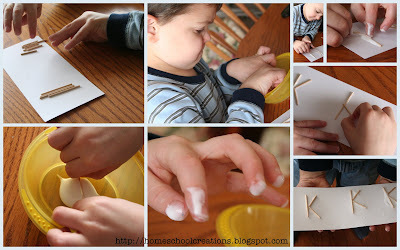 And since we still have toothpicks everywhere, I'm sure we'll do this activity again with future letters of the alphabet. Spinning off the diamond shape of a kite we used some of our foam pattern blocks from Discovery Toys to put together other shapes and pictures. Psalm 34:13- "Keep your tongue from evil." We're still using the book My ABC Bible Verses by Susan Hunt. It has a quick little devotional and a few questions at the end of the story along with review from previous weeks. This week we're having a little trouble with Zachary getting the verse straight. He's preferring two different versions of his own: "Don't stick your tongue out in evil" and "Don't keep your tongue from evil" - not quite the versions we're going for. And so we keep reviewing.